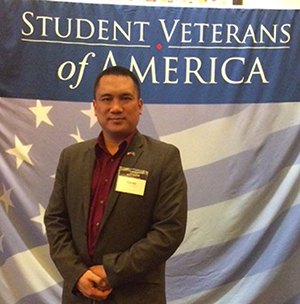 Veteran and information technology senior Jaime Ballesteros from Honolulu, Hawaii, represented Point Park University at the Student Veterans of America 2018 National Conference in San Antonio, Texas. The three-day conference featured more than 60 training sessions conducted by high-profile companies including Google, Amazon, Apple and Disney covering topics such as translating military skills into the workforce, professional development, resume writing and veteran advocacy. "I learned about the results of the National Veteran Education Success Tracker report and attended an invite-only training and hiring session with Apple," Ballesteros said. He added: "As vice president of our Student Veterans Association chapter and president of our IT student organization, I really look forward to sharing the career-enhancing knowledge I gained from the various sessions with my Point Park colleagues." After graduating this spring, Ballesteros plans to pursue a career in technology and continue his education in the M.B.A. program at Point Park University. Point Park University proudly welcomes veterans and military families. Learn how to apply for veteran benefits. Explore the 79 undergraduate majors and 21 master's and doctoral degree programs Point Park offers.